If you have read any of my Batman reviews, you know how much I loved this book, and you know how I truly loved this series. I actually had to take a break from reviewing these books after my fellow 4LN writer Stephen Andrew called me “unabashedly biased” when it comes to these books, and he’s not wrong. Still the coolest thing to happen to me while writing for Four Letter Nerd was when Snyder retweeted my article about him, he then followed me on Twitter, and the dude just seems so nice that it makes me an even bigger fan of his. In the final issue of Snyder and Capullo’s Batman epic, we get to see how Batman handles a quiet night in Gotham. The city looses power, and Batman assumes that something terrible is about to happen, so he begins patrolling the streets trying to uncover which terrible thing(s) could be approaching. Lets be completely honest, nothing good ever happens in Gotham so Bats has every right to suspect something awful coming in the darkness. 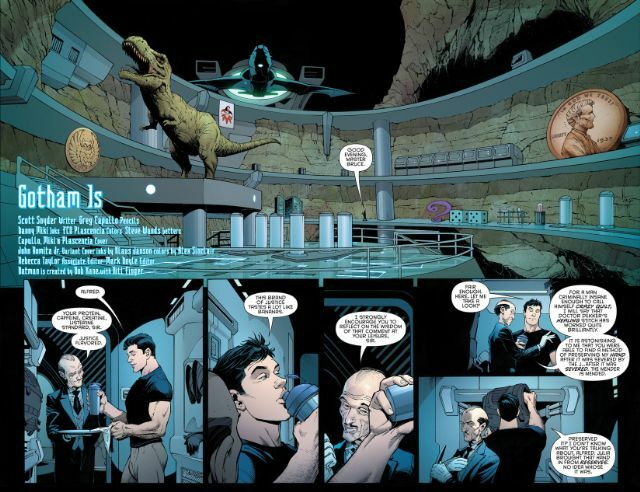 Batman starts his night in the Batcave and heads to Arkham Asylum, similarly to how the series started in Batman #1. 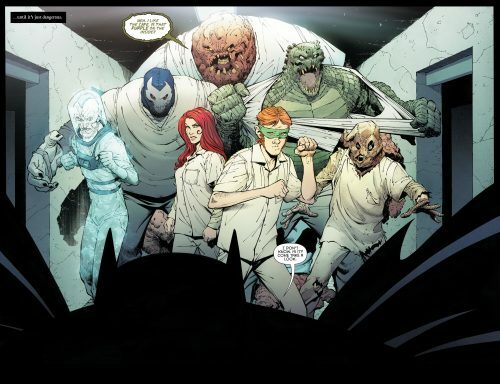 Following Arkham, Batman has a lead on The Court of Owls but it becomes a dead end. This is a great final issue because we see Batman return to some of the most iconic story lines of this five year Batman run. Each page seems like a throwback to every previous story arc with a hodgepodge of Batman’s rouges making small appearances. The art is once again top notch and I fully believe that, as time goes on, when people think back about Batman in comics, Greg Capullo will be the artist they think of. (Similar to how when we think of Spider-Man, John Romita is the first artist that comes to mind.) Capullo definitely left his mark on the flagship DC book and, in my honest opinion, it will be a very long time until someone can fill those shoes again. Capullo and Danny Miki made one of the best artistic teams in comics, and they were a perfect yin & yang to one another. Capullo with the dark and brooding artwork, and Miki with the bright and bold colors that pop off the pages. We had some of the darkest Batman stories, but the art was so vibrant and refreshing it brought a new feel to such a classic character. Working in a comic book shop (Comix City Too! ), every Wednesday I look at our wall of new comic and try to figure out what the best comic cover is, and this week it went to Batman #51. 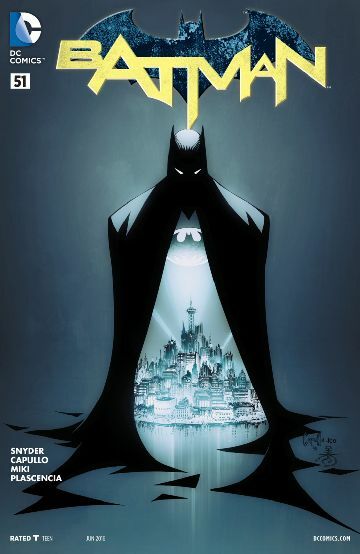 The cover is just perfect for what the book means, Batman standing with his cape wrapped around Gotham. Batman is the shroud of protection around Gotham, Batman is the gargoyle on Wayne Tower, and Gotham is thankful for Batman. This issue ends Scott and Capullo’s run on Batman, and I just want to personally thank them for everything they have done for Batman and for being the creative team that were the helm of the most epic Batman run I have ever read. I doubt either of them will read this, but as a fanboy I just want to personally thank you. Whenever a new comic reader comes into my store Batman is the first book I recommend. Scott Snyder will be writing All-Star Batman with art by John Romita Jr, and a slew of other fantastic artist, and Greg Capullo and Scott Snyder will return to an unnamed DC project sometime in 2017.